Bombertech Pindad Driptank Review - Daily Vaping Deals & The Best Vape Product Reviews at Vaping Cheap! Rebuildable dripping tank atomizers have become increasingly popular over the past year, and we’ve seen many released by tons of different companies. However, some vapers simply disliked filling these types of atomizers due to their filling methods. Bombertech has recently released the Pindad Driptank, and they have included a squonk 510 pin, which is something that can certainly resolve any filling annoyances a vaper may have. This is not really seen too much in the world of RDTAs, which definitely makes this atomizer unique. Before getting any further, I would like to thank Bombertech for sending the Pindad Driptank my way for the purposes of this review. I will go over my first impressions, building and wicking, performance, pros and cons, and conclude with whether or not I recommend this atomizer! Check out the Bombertech Pindad Driptank Here! Click Here to Check out the Bombertech Pindad Driptank! When first receiving the Bombertech Pindad Driptank, I immediately noticed the similar packaging to the Firefly RDA. This type of packaging is surely unique, and much different than what I typically see with atomizers. This is a pro in my opinion, as a good and unique presentation is always a great start to any product. The packaging itself is quite small, so I did not expect much to be included. However, I was surely wrong in this case as Bombertech does include quite a bit with the Pindad. 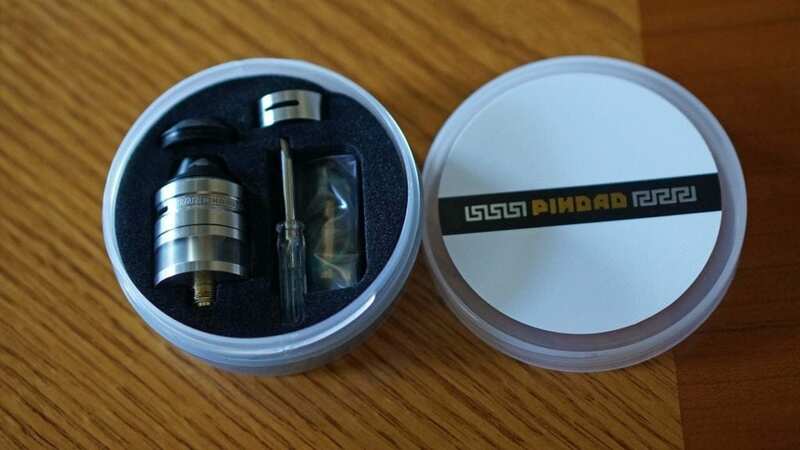 Included with this atomizer, you receive the Pindad Driptank, a bag of spare parts which does hold the squonk 510 pin, a single coil airflow sleeve, a 510 drip tip adapter, a small screwdriver, and a single coil plug (which is pre-installed). This is another pro, as you do get a lot of extras for the money. Upon taking the Bombertech Pindad Driptank out of the packaging, what I first noticed was how small it was. This atomizer is very compact, and personally, I love compact atomizers. Some vapers may see this as a con since this already tells you that it will have little e-liquid capacity or some vapers may prefer larger atomizers. This RDTA does have a 2ml e-liquid capacity, and it does sport an overall diameter of 22mm. 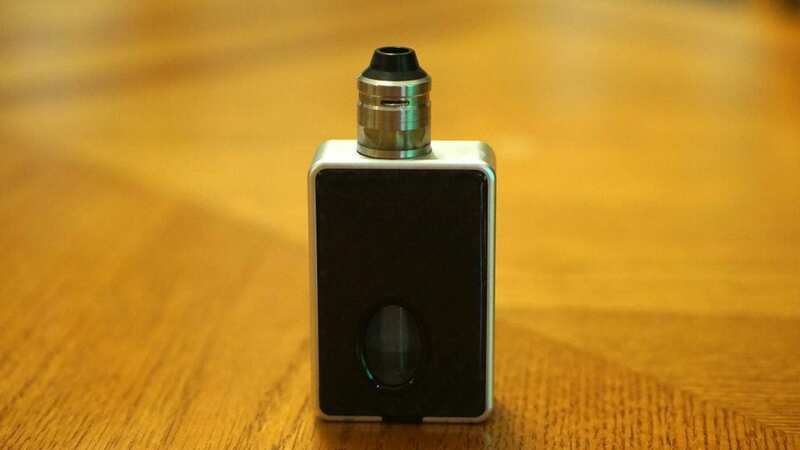 Even though it only has a 2ml e-liquid capacity, it does have a squonk 510 pin that you can utilize to fill it quite easily, which is something we’ll get into later on in this review. In addition, even if you are not filling it via the squonk 510 pin, the filling method is right in the middle of the build deck area. You can fill it this way by simply pushing your unicorn bottle tip or dropper bottle into the fill hole, and fill. It really is easy to fill this tank with either method, but of course, with squonking it makes it that much easier. The build quality of the Bombertech Pindad Driptank was also quite good. The machining was excellent, and all of the threading is smooth. This is definitely another huge pro in my book. Something worth mentioning is that this atomizer did come drenched in machine oil, which is a con in my opinion. I literally had to wash this RDTA two times with soap and warm water to get all of the machine oil off. Even though this is not the biggest con, it is still something to mention as I know there are many vapers who easily get annoyed by this. Overall, my first impressions of the Bombertech Pindad Driptank were positive! This RDTA does include a ton of extras, and best of all, includes a squonk 510 pin, which is something we don’t see too often with these style of atomizers! The Bombertech Pindad Driptank features a two post velocity styled build deck, so building on this atomizer is a breeze! I do prefer these style build decks since it makes installing and centering coils much easier in comparison to other build decks. In my opinion, newer builders and experienced builders will not have any issues when it comes to building on this RDTA. One thing to mention before installing any build or wicking is that you need to make sure to screw down and tighten the base section first. Not doing this can cause leaking issues. However, something worth mentioning is that since this atomizer is compact and since it is only 22mm in diameter, you don’t really have much room to install larger coil builds. You can fit normal Claptons and smaller Fused Claptons, but anything bigger, and you might have a hard time fitting them in without causing a short. Also, I do think larger coil builds would probably be a bit too hot for this atomizer since the coils aren’t too far from your mouth when you are vaping. This can be seen as a subjective con. Wicking this atomizer is also a breeze. If you’re used to wicking any other type of RDTA, then this is really no different. 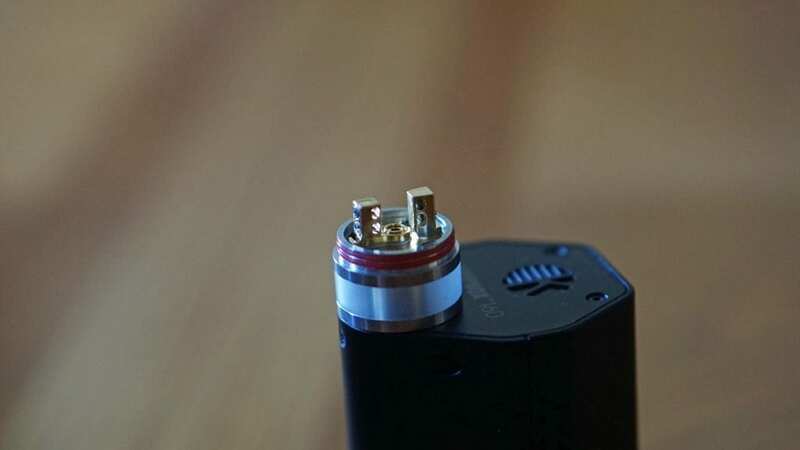 Since the entire RDTA can almost come apart, you have the freedom of positioning your cotton before attaching the tank section, and the mid section. This makes wicking even easier on this RDTA. I recommend cutting your cotton to where it barely will hang into the tank section. I found this to be the most effective way to wicking this atomizer. All in all, building and wicking on the Bombertech Pindad Driptank is incredibly easy. 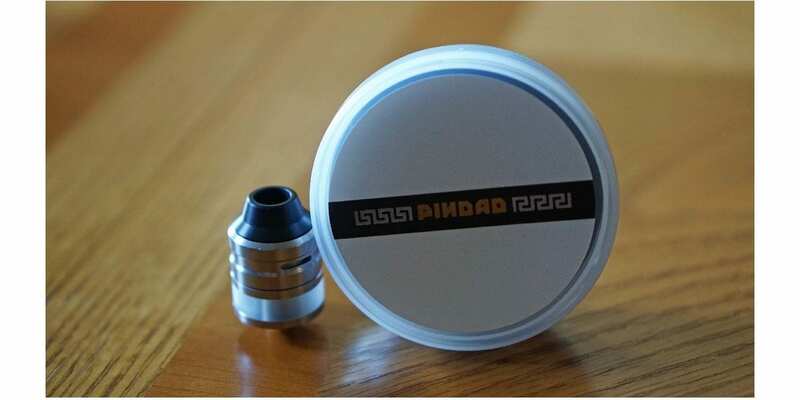 Like mentioned previously, if you’re used to wicking any other RDTAs, then you’ll feel at home with this atomizer. In addition, since this atomizer does feature a two post velocity styled build deck, it makes installing coils effortless. The performance of the Bombertech Pindad Driptank is excellent! I will first say that my preferred coil build for this atomizer was a simple dual 24GA Kanthal round wire build. I did try other builds such as Claptons and Fused Claptons, but I found that the performance was just as good with a simple build. In addition, with my preferred coil build I can vape it a lower wattages and conserve battery life. Something worth mentioning is that this atomizer does support both single and dual coil builds. It does vape great either way, but I typically prefer dual coil builds. However, it’s still a pro that you can use single or dual coil builds! I primarily used this RDTA on a squonk box mod since it makes filling this atomizer quick and easy. With only a 2ml e-liquid capacity, you will empty the tank quite quickly, but with the squonk 510 pin, you can fill it in literally 10 seconds. I do want to mention that the tank section is not made of glass, and it seems to be made of polycarbonate. This is definitely a con in my opinion as I would have much preferred it to be glass. With my preferred coil build, I would vape this RDTA between 35w and 50w. At higher wattages, I got a nice warm and satisfying vape experience. The airflow is smooth as well. I did prefer to close off the airflow about 1/4 of the way. With the airflow positioned like this, the flavor was slightly better, and it provided me with a more restricted lung hit, which is something I prefer. With the airflow wide open, it is still slightly restrictive, but it does have enough airflow to suit many vapers. It’s not massive amounts of airflow though, which may be seen as a subjective con. Speaking about flavor, the flavor off of the Bombertech Pindad Driptank is top notch. Since this atomizer does sport a compact design, and the coils aren’t too far from your mouth when you’re vaping, it was to be expected that the flavor would be good. Also, I experienced minimal spitback with this atomizer, which was quite surprising as many smaller atomizers do tend to have a lot of spitback. The vapor production was also satisfying from this RDTA. However, this is by no means a cloud chasing atomizer, it’s much more of a flavor chaser in my opinion. The way the airflow control is designed, the airflow is always directed at your coils which means you don’t really have to mess with it to have the airflow in an ideal position, which is a huge pro in my opinion. The airflow control rings sit within the top cap, which is why the airflow will always be directed at your coils. The airflow is very easy to adjust as well. The included wide bore drip tip is comfortable to use, and I honestly didn’t find the need to use my own preferred 510 drip tip. You do have the option to use your own 510 drip tips with the included 510 drip tip adapter, which is yet again another pro. All in all, the performance of the Bombertech Pindad Driptank was excellent! The flavor was fantastic, and the fact that you can use a squonk 510 pin makes this atomizer that much better! In conclusion, the Bombertech Pindad Driptank is a fantastic RDTA that provides you with excellent flavor and includes a Squonk 510 pin which makes filling this tank incredibly easy when using this atomizer on a squonk box mod. I do like the overall design of this atomizer, and I thin it looks great on most of my devices that I attach it to. The fact that this atomizer supports both single and dual coil builds is another huge pro in my opinion. Even though there were a few cons to the Pindad, none of them were deal breakers in my opinion. I do wish they included a glass tank section, as this would be something that is much preferred by many vapers. Regardless, it does not take anything away from its overall performance, and great design. This is my first RDTA with a squonk 510 pin, and I hope to see this included with more RDTAs in the future as it just makes filling any atomizer incredibly easier. I do think we’ll see this more in not just RDTAs, but in most rebuildable atomizers since squonking is becoming more and more popular. So, if you’re in the market for a new RDTA that includes a squonk 510 pin, then I can highly recommend the Bombertech Pindad Driptank!